It seems to happen at every large Airstream rally: someone, somehow, gets locked out of their trailer or motorhome. I have seen it far too many times. There’s panicked look of owners as they realize they can’t get back in. They think about their wallet, pets, cell phone, and everything else they need that’s inside. Then the the slow circulation of bystanders begins, anxious to help but not capable of doing much. Then someone suggests climbing in through a cargo hatch. This can work (and I’ve done it) but it only works on a few floorplans that have an exterior cargo compartment that goes under the bed—and you’ve got a very thin person on hand—and the bed is on hinges—and the hinges are not locked down. Finally the inevitable call to a locksmith goes out. An hour or two later, and a $100 bill, and they’re back inside. Fortunately it’s very easy to prevent the shock of being locked out. We sell blank keys for most Airstream trailer locks (door handle and deadbolt), Basecamps, and some motorhomes. As I mentioned, you can’t find these at most locksmiths, so you need to order the blanks in order to get duplicates made. After you’ve had the duplicates made (I suggest two spare sets), put one set in a hidden place. There are lots of interesting hiding places on the outside of an Airstream if you think about it for a while. I won’t mention them all here (why help potential thieves?) but if you walk around the outside and look closely at the trailer A-frame, various unlocked access hatches, underside, wheel wells, and compartments I bet you’ll come up with a few ideas of your own. 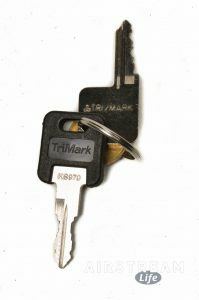 A magnetic Hide-A-Key is helpful for fastening your keys to steel parts. Another place to keep spares is in your tow vehicle, but that assumes you’ll have access to the vehicle even if you’ve left your Airstream keys inside. Or, hide a spare key for the tow vehicle on the outside of the Airstream, and hide an Airstream key inside the truck. But whatever you do, get a couple of spare sets of keys for your Airstream now! Someday you’ll be glad you did.